Less then 200 kilometers away from the Bangkok airport the sleepy seaside resort of Cha-Am is located. Here you can enjoy recreation and relaxation. 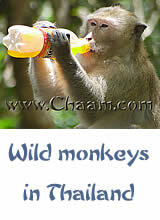 Cha-Am is located at the Gulf of Thailand, which always has low waves and large beaches. Your house is less than one kilometer away from the ocean. You can walk to the beach in around 15 minutes, with a rented motorbike you can drive the distance in 2-3 minutes. The resort is located in a quiet area, in the surroundings is nearly only nature to find. If you are in the resort, turn left, then you come after about 200 meters to a junction where you can find cheap and very good Thai restaurants and shopping facilities. The Family Mart, for example, opens daily for 24 hours. Your home is located in the Sport Village Resort, which is shown in the top left corner of the map. It is in the middle of the second block of houses on the left.